This year Brenda Tarr and Tom Kimber became co-editors of the Newsletter and took it ‘on-line’. They’ve done a stellar job. When, due to health reasons, Brenda stepped back, Tom stepped up! Cindy Kimber has created and distributed posters promoting Family Hikes with great effect. Most recently, Susan Young has enhanced our Facebook presence. Carol Miller, Vice-President, has created new marketing instruments: vertical and horizontal banners, flyer, and tear-off map of the Stratford Side Trail. Using professional graphics design services, she oversaw the creation of a new style guide for the Avon Trail logo. 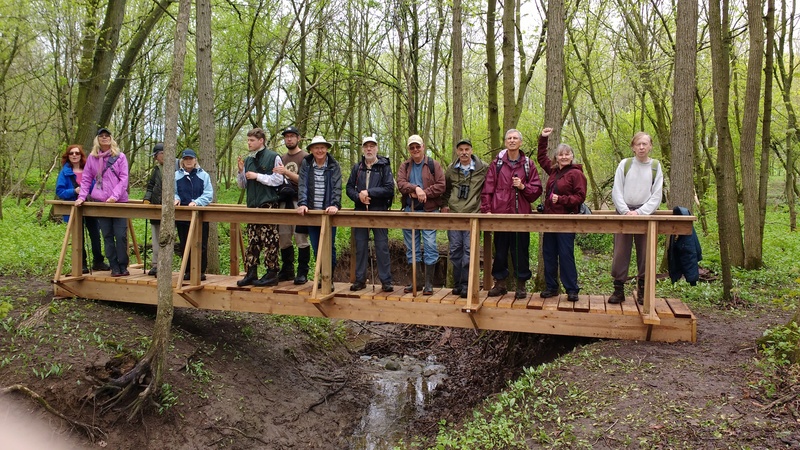 At Terry Aitken’s suggestion, the board contracted with RPA Photography to create a video depicting maintenance and hiking on the Avon Trail to promote the Trail with service clubs and other organizations. Brian Tarr gave leadership to a new Adopt-a-Highway initiative, whereby the Avon Trail was assigned a 3 km stretch of Highway 7 east of Stratford to pick up refuse. About 12 volunteers filled many garbage bags, some of which was recyclable. The Third Annual Wildwood Challenge, organized by Bruce Graham, attracted a record number of 51 participants and, despite an all-day drizzle, was a huge hit! Aiming to attract younger walkers on the trail, the board engaged Ondago, a Quebec web developer of on-line trails, to create an ‘app’ of the Avon Trail, launching this month. Carolyn and I attended the Hike Ontario Summit, (Annual Meeting) in Orillia, hosted by the Ganaraska Hiking Club in conjunction with their 50th Anniversary. Part of the Summit, an Indigenous ceremony of Smudging and Blessing of Waters, was specially moving. Water had been carried in flasks relayed by hikers from the Port Hope trail head and Wasaga Beach trail end, meeting in Orillia. Looking forward, goals include developing a greater exposure in the east end of the trail, seeking help with website managing and membership keeping, and editing a new Trail Guide edition.